Generally during autumn but will go down any time when they found the conditions suitable. The nest is usually located in a bush or shrub. The nest is globular about 150mm in diameter and lacks an entrance tunnel. It is constructed from dead grass and lined with feathers. In the avery environment the Star prefers to nest in bundles of bush rather than other receptacles. Because they like to nest close to the ground and preferably in a grass tussock, it would be advantageous to provide these (or some sort of artificial substitute) for nesting. To avoid problems with exposure, Star Finches should encouraged to nest in a sheltered section of the aviary. The Star Finch performs a song and dance whilst holding a grass stem (or simular token) in his bill. The feathers on the head breast and flanks are ruffed and the tail twisted toward the female. This is accompanied by a great deal of bobbing. The Yellow face is the most popular and prevelant. There is also a pied, fawn, cinamon, isabele and blue mutation. The pied is not as dramatic as many pied mutations, only causing a ring of white around the mask and white wing primaries and tail feathers. The fawn and cinnamon are simular, from what I understand, with varying shades of brown. This may actually be the same mutation, but is being called by the two names. If it is a "brown" mutation of the Star, it would probably be more appropriate to be a form of dilute. Reducing both the green and yellow colors of the body, but not the red. The "blue" mutation is not as dramatic as the "blue" mutation of Goudian Finches, but does iluminate the yellow base from the colouring leaving the belly and the back a dark shade of blue. This species is know to have produced hybrids with the red-cheeked Cordon-blue and Red-billed Fire Finch. Hybrids with Zebra and Crimson Finches have also been reported. 3-6 pure white eggs (15mm x 11mm). The young usually fledge at around 15-17 days. Fledged birds should not be removed from the parents until at least 4 weeks after fledging. In captivity, Star Finches may preduce as many as three broods per year. Maturity is attained at about 12 months, but these birds are most productive after their second year and continue to be so until about their fifth year. Personal experience indicated that birds as young as 9 months successfully waened clutches of 3 and more. Disposition: Peaceful, inoffensive, somewhat shy, good in a mixed flight. They may be kept in a colonyh of 3 or more pairs, or as single pairs. They will not tolerate nest inspections and will desert their nest at the slightest provocation. Description and Mutations: 4 1/4 in (11 cm). Forehead, sides of head, chin & beak: bright red; neck & upper back: grey-green to olive green; wings: grey-brown; belly: yellowish green; rump & central tail feathers: crimson. Spots located on mask, chest & along the sides of the belly. Mutations include pied (but pied feathers only tend to show on the head & wings (where the pied feathers are yellow), & on the tail where the pied feathers are pink), yellow-faced (where the mask is yellow instead of red), and isabel (a lighter, more fawn version of the bird with the same markings, just in a lighter, browner tone). The rarer Eastern Star Finch (N. r. ruficauda) is the same as the red-faced Star Finch, except it lacks yellow underparts. Sexing: The visual sexual differences in Star Finches is easily identified as they are dimorphic. The red on the head is more extensive on the male than on the female. On the male the red extends below the mandible onto the chin. While the red on the female does not extend as far back at the sides, and does not occur below the mandible. The yellow on the underparts is usually more intense on the male. When sexing juveniles, it is best to wait until they start to break colour. Young males may be identified by looking flecks of red breaking through on the upper throat under the mandible, whereas young females will have no red breaking through in this area. Housing & Breeding: House in a medium (at least 30" x 2' x 2') to large-sized flight, preferably planted with a thick bush or two for cover. These birds are fairly social by nature, and so do best when housed with several pair of the same species, or with species of similar demeanor, provided that the flight is roomy enough. They can be bred as a single pair per temperature they are exposed to remains above 60 degrees F (15 C). If in a very large flight or aviary, colonly breeding may also be an option. Their cage should not only be sheltered from the cold, but also from breezes and dampness. Provide half-open nest boxes and large hooded/oval bamboo nests fairly high along the walls of the flight, and provide grasses, coconut fiber, and feathers for nesting material. 3-6 eggs will be laid, incubated for 12-15 days by both parents (as soon as the 3rd egg is laid), and the fertile eggs will hatch. Do not perform nest checks. Make sure to give the parents lots of livefood to feed their chicks soon after hatching. The young can be close-banded at 9-10 days of age, will fledge at three weeks of age, be fully independent at 5 weeks of age, and begin to molt at 8 weeks of age. They will not begin a second molt for another 7-8 months. In captivity, breeding usually is between March through September, but some may breed at any time. Foods: A good quality finch mix for their dry seed, Millet, greenfood, livefood. ( livefood which is not necessary for rasing babies or breeding) , medicated grit. Natural Habitat: Australian Star Finches range from about Rockhampton, north to Cape York, Northern Territory, the Kimberleys, and south to the Ashburton district, the Barlee Range and Mount Augustus, occurring as far south as central New South Wales. 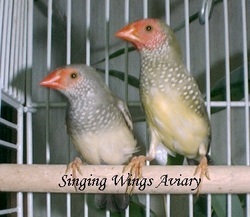 Additional Information: Star finch best breeding years are between 2 and 5 years. Their lifespan is about 7 years. Health Problems Common to this Species: The normal worming (worm away recommended) and anti Coccidia (Cocci-Care recommended) treatments should be maintained throughout the year, as the Stars preference for spending a lot of time on the ground makes it an ideal host for parasitic worms. Overgrown toenails occasionally present problems in this species. Showing: Star Finches make excellent show birds, providing their flighty temperament can be contained. The star finch is the first bird I won a show with on my first showing. The judges look for richness of colour, an evenness and quantity of spotting, and good quality feather. Care should be taken to avoid scaliness of the beak, feet and legs. Scaliness of the mandible becomes very obvious on the red colour. If the bird is not sufficiently well-trained, it will damage its tail by clinging on the wire cage front. Description: In the normal form the Star Finch has a bright red face which extends past the cheeks in males. The overal body color of this species is an olive green with a beige-yellow underbelly. Tiny white star like dots cover the the crown of the head circling around the outer edge of the eyes to the cheeks and extending from the chin to the chest then down the flanks. Both sexes have red beaks and dark eyes. Size: The average size for this species is 4.5in (11cm). Origin: This species originated and can be currently found in Northern Australia. Sexing: Once molted into adult plumage Star Finches can easily be sexed visually. The males have a brighter red face mask which extends past the cheeks while hens have very little facial color with no red on the chin. Hens are also a duller grey-green with more white stars under the lower mandible and a beige colored belly while males are more olive green in color with a yellow colored belly. Mutations/Sub-species: Aside from the normal form of Star Finches a few mutations are available such as yellow face (pumkin face) which chances the red face to orange, pied which give the bird blotches with no color pigment and fawn which changes the overall body color to a light brown color. Diet: Star Finches do well on a finch mix which includes proso, japanese, german, siberian millet and canary seed. They also need fresh foods such as kale, green leaf lettuce, boiled egg, grated carrot, brocolli tops and chopped spinach. A vitamin/mineral supplement should be added in some form either in the water or on fresh foods. We chose to use Petamine and Wheat Germ Oil Blend mixed in with our "homemade eggfood" in which we give to all our birds. Cuttlebone, grit and fresh water should be available at all times. General Care: Overall they are a pretty easy species to maintain but may need frequent nail trims. Compatibility: This species is peaceful and a good canidate for a mixed aviary. They get along with thier own species and other species of the same temperment. Housing: Star Finches can be housed in cages or planted aviaries of mixed species or their own species. Just be sure the birds you house them with also have a peaceful temperment. Best breeding attempts seem to happen when they are bred one pair per cage or planted flight. They will require heat during the winter at least to 55 degrees and will breed best in 70-75 degrees. Song: The male's song is somewhat quiet but pleasant. He will puff his head feathers and lean forward while warbling his throat. He will also dance for the hen going from side to side in an up and down motion much like a Gouldian Finch only slower. Below is a short clip of the male. It is a little distorted in sound by the pugnacious Zebra Finches close by. Breeding: Like most Austrailian Finches the Star Finches breeding season normaly ranges from mid October- March. However they may breed any time during the year if in breeding condition and the right enviroment. They often accept finch size nest boxes, bamboo finch nest or will build natural nest using coconut fiber, sisal, course grasses and feathers. After the male has constructed the nest and the hen accepts she will lay 3-6 eggs which she inccubates for 14 days. The male will on occasion sit with the hen or relive her from her duties for a while. Chicks normaly leave the nest at 3 weeks of age and are weaned by 6 weeks of age. It will take juveniles 4-6 months to obtain full adult plumage. While this species is eager to nest and breed they do not always make the best parents when feeding babies so be sure to supply them with plently of livefood and eggfood to feed the babies. You may also want to have a few Society Finch pairs set up as fosters just incase. * "They're my favorites-I think they listen to me when I talk to them." * "Superb finches, one of the nicest, most pleasant Australian types to keep." * "I love 'em-great fun!" * The familiar Red-faced Star Finch, Neochmia ruficauda clarescens, locally common across the north of Australia. * The extremely rare Eastern Star Finch, Neochmia ruficauda ruficauda, similar to the Red-faced but lacking the yellow underparts. Found only in isolated areas in eastern Australia, this form is considered endangered (due to habitat destruction), with very few reported sightings in the last 50 years. In 1983, during a two-month study supported by the Royal Australian Ornithological Union to develop a recovery plan for the species in northern Queensland, no birds were found. As far as I can tell, this form is not represented in aviculture. Working from the Red-faced Star Finch, breeders have developed yellow-faced and bronze-faced mutations. These birds are identical to the red-faced variety, except for the color of the feathers around the face. CARE AND FEEDING With Stars (as with most other finches), the roomier the cage or flight, the happier the birds will be. If you house your Stars in a cage, choose one that's at least 30 inches long so the birds can fly freely. Also, make sure it's designed for finches, not cockatiels or small parrots-the spacing between the bars should be no larger than one-half inch. Since Stars can be shy, providing some plants (real or otherwise) will help make them feel more secure, and give them places to hide. True to their grassfinch heritage, Stars more than almost any other finch appreciate the opportunity to perch on upright stalks or branches rather than horizontal perches. Stars generally do not sleep in a nest, preferring the highest perch possible. One successful breeder says that his female will stop brooding the young as soon as possible so she can leave the nest and sleep on a branch. Since they don't sleep in a nest where they can keep each other warm, you'll need to provide a sheltered sleeping area if you house your Stars in an outside aviary, to protect them from the cold and damp even during the warm season. Whether you keep you birds inside or out, don't expose them to temperatures of less than 55-60:F (12-15:C) for more than brief periods. To keep their unique plumage in top shape, Stars absolutely require frequent opportunities for bathing. Several sources also indicate that without some natural sunlight, the feathers become dull and faded. If you keep your birds indoors year-round, this requirement perhaps could be addressed through careful balancing of artificial light sources. Star Finches will thrive on a typically varied finch diet-a good basic finch seed mix, fresh greens, grated fresh or cooked vegetables, mashed hard-boiled egg, soaked seed, spray millet, and cooked rice. Many Stars will accept meal worms. Provide a cuttlebone for calcium and grit to aid digestion. Like most finches, Stars love fresh seedheads (crabgrass is a good choice, and commonly available). You might try leaving the stalks long and fastening them in an upright position, so your Stars can feed in true grassfinch fashion by climbing up the stalks to pick out the fresh seeds. A STAR IS BORN! The frustrating thing about breeding Star Finches is that although they're often more than willing to build nests and lay eggs, their parenting skills sometimes leave a lot to be desired-one Star lover calls them "good breeders, but poor feeders". They may refuse to incubate or feed, or throw their chicks out of the nest, so many Stars are fostered using Society Finches-they are supposedly among the easiest of finches to foster. Some breeders report no particular difficulties in breeding Stars, but do recommend a spacious cage and a high-quality protein supplement. The male Star Finch courts the female with song, often sitting very close to her and peering into her face as if to ensure she gets the message. Other Stars may cluster around the singing male to watch and listen. The male also performs a mating dance, swaying from side to side with a little up and down motion, in a slower version of the Gouldian Finch's hop dance. While he dances, the male almost always holds a feather or piece of nesting material by the very tip, waving it from side to side to indicate he's ready and able to join in the tasks of building a nest and raising young. Breeding season is probably the only time when a male Star will get at all aggressive or territorial, and then only in the immediate nesting territory. A pair will frequently build their own round nest using various grasses, shredded paper, and other nesting materials; some pairs will accept a large basket or half-open box. The female lays 3-6 eggs, then both partners incubate the eggs for about 14 days. The babies are fed in the nest by both parents for about a month. In the wild, the rearing diet is primarily insects. To raise young successfully in captivity, Stars require a rich bill of fare throughout the breeding season-greens, seeds, insects, egg food, and a commercial rearing mixture. One breeder succeeds-without fostering-by offering seeds, meal worms, bread soaked in milk and maple syrup, hard-boiled egg, and some live plants (mostly herbs like basil, rosemary, etc.). Once out of the nest, young Star Finches are strong flyers, and after only a few days will join their parents at night on the top-most branches. Stars are unusual in that they pass through a distinct sub-adult plumage when they look similar to the adult, but show no spots or red feathering on the head. They start showing some red coloring at about three months, and can take up to nine months to reach the full adult plumage.